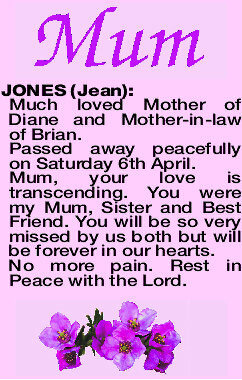 JONES JEAN Much loved Mother of Diane and Mother-in-law of Brian. Passed away peacefully on Saturday 6th April. Mum, your love is transcending. You were my Mum, Sister and Best Friend. 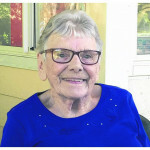 You will be so very missed by us both but will be forever in our hearts. No more pain. Rest in Peace with the Lord. 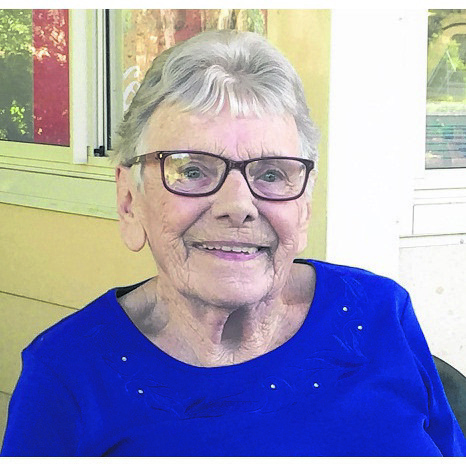 The Funeral Service for Mrs Jean Jones of Midland will take place in our Chapel, 131 Great Eastern Highway Bellevue commencing at 10am WEDNESDAY (17.04.2019) Cremation will take place privately at a later time. 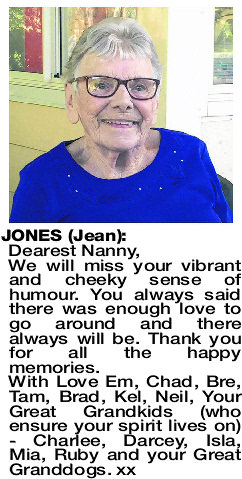 We will miss your vibrant and cheeky sense of humour. You always said there was enough love to go around and there always will be. Thank you for all the happy memories.